This project ended on 31 December 2017 after a very productive run; see its publications and outputs here. 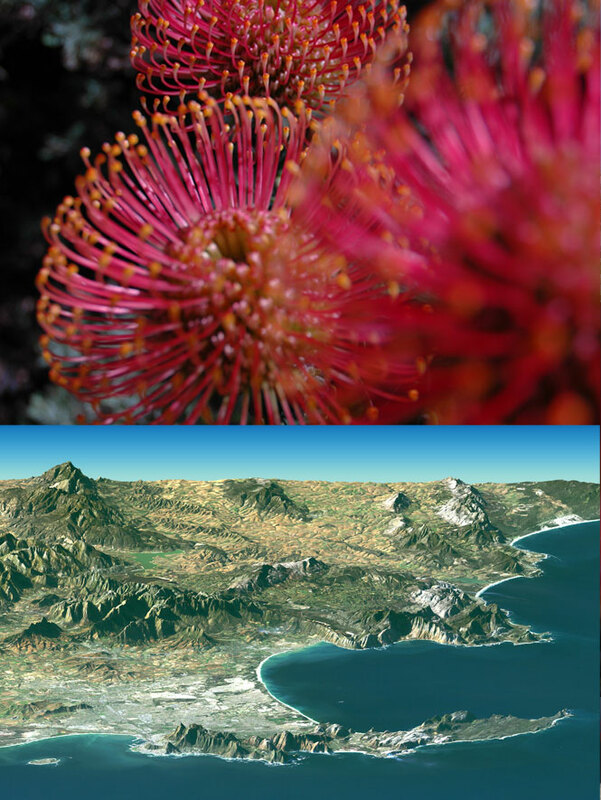 The MOVE project in Cape Town consists of an ecological vegetation survey lead by Dr. Pippin Andersson at the University of Cape Town. This is paired with The Cape Town Civic Network Study lead by Dr. Henrik Ernstson. Below you find reported status of the MOVE ecological vegetation report as of October 2013. During 2014, the Cape Town CIVNET Study will hold a major conference with those over 130 organisations that participated in the social network survey in Cape Town. The MOVE Research Group is meeting again in Stockholm in early 2015 for a synthesis workshop. Several presentations and publications are being developed for 2015. This project has been carried out across a stretch of suburbs in the City of Cape Town. Fieldwork for this project started in July 2013, and has been carried out by Pippin Anderson, Oliver Cowan, Ncedo Mngibici, and David Cowan. The following methodology was adopted. Green space was sampled in a transect, run largely on historic Cape Flats Sand Plain Fynbos, between the upper income areas of Constantia and in a south-easterly direction towards the lower income areas of Grassy Park. An analysis by Erik Andersson of the broad area of interest, using plot density, was used to inform plot selection where a transect of variable urban form could be sampled (figure 1). 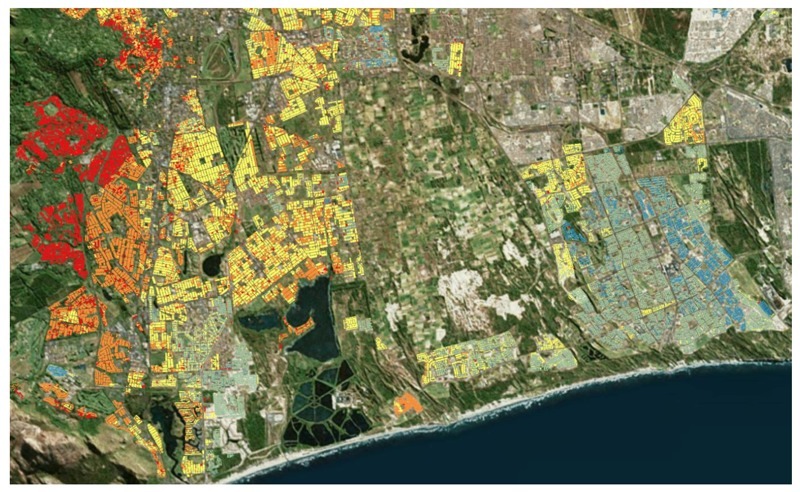 Soft surfaces (green and brown areas) were sampled and these included the following land use types: private gardens, including in informal settlements in poor working class and informal settlements, public open space, and conservation areas. Replication of sample plots in the conservation areas could constitute pseudo replication and these sites should be analysed together. Sampling in the informal settlements of Schkaapkraal and Vrygrond was difficult as private gardens were virtually non-existent and the safety of the fieldworkers was also a restricting factor. It is important to note that while Vrygrond was the obvious informal settlement along the transect in question (most accessible, and of a size that would allow better sampling), this fell outside the historic vegetation type where this settlement would have fallen on Strandveld. This will need to be noted in analysing the data, and will certainly be evident in the soil analysis. During 2014 analysis is done, together with integrative analysis with historical data and the CIVNET study. Further comparative analyses will be done with the MOVE New Orleans study. Figure 1. Urban form across the MOVE Cape Town case study including Grassy Park, Vrygrond, Muizenberg and Constantia. The figures shows areas of varying density from low density in red and orange to more dense form in yellow and most dense in blue. The colours follow closely wealth and social status, with red being very wealthy to yellow mainly being apartheid township areas, to informal settlement as the most dense form (graphic thanks to E. Andersson). Figure 2. 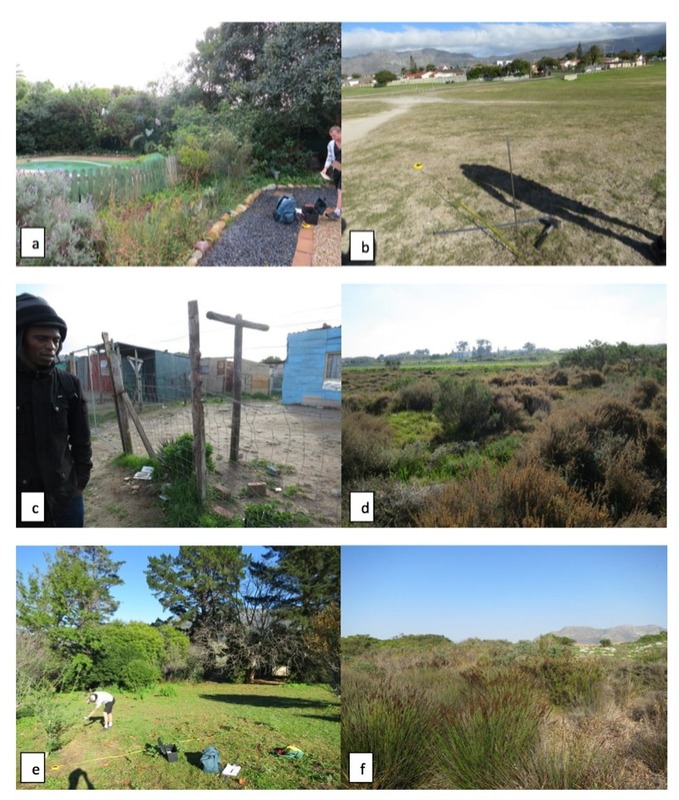 These plates give some idea of the diversity of open space sampled a) Private garden in Constantia, b) public field in Retreat, c) Schaapkraal, d) Kenilworth Racecourse Conservation Area, e) private garden in Tokai, f) Rondevlei Nature Reserve. Photo fro field work for MOVE Cape Town vegetation analysis in 2013.